Disney's official promo for the event. I was out of the loop on Disney’s newest event that hit theaters across the nation today. Around 4:30 I took a break from work emailing to check out Fandango.com, thinking I’d take him to see Alpha and Omega, another kiddie movie. 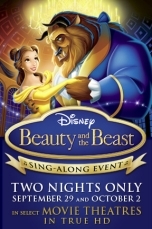 But wait, Beauty and The Beast “Sing Along Event” only playing two days? Okay, great. I keep reading. It’s tonight. Okay, I’m now sweating. At 6:30 pm? I look at the gray sky, I call the weather line (202 936 1212, a number I’ve been relying on since high school), hear that tonight is a rain-out, and get busy closing out my workday.